Healthy angels are full-bodied like this robust Apolemichthys trimaculatus. Many marine angels, sick Dear Bob, <Jo?/John> I'm Jo? from Portugal. I don't know if this is the right way or contact to ask this but, I was reading the asks and answers so... here I'm... 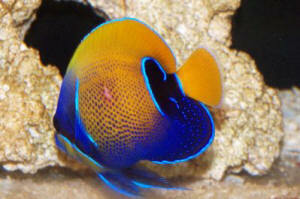 I'm 28 years old and I have reef and fish-only aquariums since 1990. I almost really don't know what species of corals, invertebrates and fishes I didn't had as least one time pass these years. 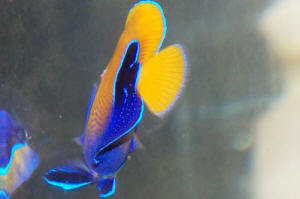 To treat fishes, Pomacanthus imperators, P. annularis, Apolemichthys, Zanclus, Nemateleotris, etc etc etc..... :)...... I always used (and I use), Waterlife products (Myxazin, Sterazin, Octozin, Cuprazin, etc) and some human medicines (Resochina for example), whit great results. But now, I have a problem. In one fish-only aquarium, I have at about two years ago, one Apolemichthys trimaculatus XXL and one P. Annularis S/M. They was simply sobered until, I bought two little Holocanthus Passer and putted with them, 2 week's ago, without the proper Quarantine...! <Que lastima! Spanish, my Portuguese is worse> The 2 Passer's died 1 week ago, with the symptoms that Apolemichthys and Pomacanthus are having now. They don't have ict? or criptocarie. They are eating and breathing normally. But they are grazing and when swimming they flick and flick and flick..... the eyes are staying cloudy too, like what happened whit Passer's before dead. <May be flukes... monogenetic or digenetic Trematodes... a type of flatworm> I had already tried to treat them with Cuprazin, Sterazin, and nothing.... Today I did again a good change of water (with osmosis and ionic change resin, red sea salt, oligo. elements, etc etc ), and I'm thinking treat them after tomorrow with Octozin! The parameters of water are excellent like always did. I'm very sad because first of all they are live. animals, second, I love them and I see that they are really trying to live, and I don't know anymore what to do. If you can, please help me to help them! <I would run your fishes through a pH adjusted freshwater AND formalin dip/bath as proscribed on WetWebMedia.com AND move these fishes to other quarters (another tank than the one they are in), AND add cleaner organisms (Gobiosoma gobies, Lysmata sp. shrimp). Bob Fenner> Thank you Bob. My best regards, Jo?